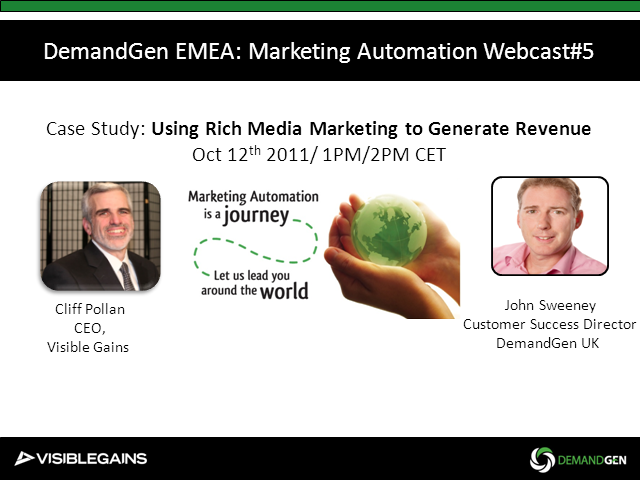 Join John Sweeney for another session on leading edge Marketing Automation tools and techniques. Todayâs webcast notes the explosion of video, info-graphics and other visual tools in the sales and marketing process. In this session he will be joined by Cliff Pollan, CEO of Visible Gains. Prior to joining Visible Gains Cliff was CEO at Lumigent Technologies. Â· Why sales and marketing need these tools. Â· How these tools support the buyers journey. Â· Real life examples of how new rich media technologies are being used in sales and marketing. Â· Techniques for integrating with Marketing Automation and CRM Systems.